'Costata Romanesco' is an heirloom Italian zucchini famed for its flavor and texture. Flavor is of gourmet quality and much sweeter and nuttier than modern hybrids. The fruits are green with lighter flecks, and they are ribbed, which makes attractive scalloped rounds when sliced. This is a wonderful variety, well-known by gourmet chefs. But it does have its flaws. Primary among them is the size; it has huge, sprawling plants that take up a lot of space. Yield is only half that of many hybrid varieties, and it is susceptible to powdery mildew which can cut short its productivity. Still, many growers find that Costata Romanesco is well worth the trouble because it is so distinctive and delicious. 52 days to maturity. Want to stand out from the competition among sunflower growers? 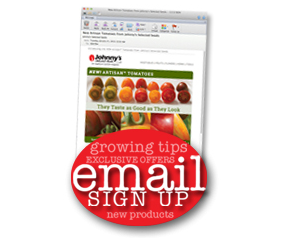 Try growing these branching varieties with unusual colors that will generate excitement among your customers. 'Peach Passion' has fluffy yellow petals suffused with hints of peach, surrounding greenish yellow centers. It's a heavy producer, too, and blooms in just 55 days. 'Buttercream' has pale, delicate petals that contrast dramatically with the dark brown centers. 50-60 days to maturity. 'Chocolate' is the darkest brown sunflower, with petals that are absolutely velvety. 60 days to maturity. Branching sunflowers tend to not be as long-lived in the vase as single-stemmed sunflowers, so they should be picked just as the petals are lifting off the face of the flower. Use extremely clean buckets, clippers and water and, for non-organic growers, flower preservative to extend vase life. As the article about weeding in this issue points out, you should choose the right tool for each kind of weed problem. Johnny's has a great selection of hoes for just about every situation you might encounter. The Long-Handled Wire Weeder is designed for precision weeding among closely spaced seedlings such as salad mix, carrots, and onions. A Collinear Hoe allows you to stand up straight and slice weeds off just below the surface. Watch video of Eliot Coleman using the Collinear Hoe. Stirrup Hoes are designed to handle bigger weeds quickly, using a push and pull motion that is made even easier with the optional mushroom grip. The Trapezoid Hoe has a sharp blade for skimming across a bed of mid-sized weeds, and sharp corners for digging out stubborn roots. The Cobrahead® has a powerful steel blade that can be used to sweep away small weeds, dig out big ones, make furrows, and much more, depending on how you turn the blade. 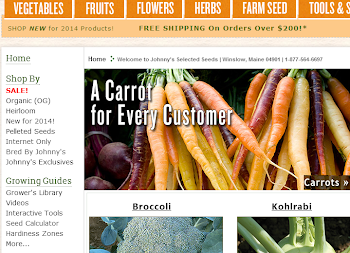 For close hand work, Johnny's offers a half-dozen styles of short-handled cultivators. The Glaser Wheel Hoe is the most efficient way to weed larger areas, like the footpath and just to either side of it. It has optional accessories that can be attached to the frame for other tasks such as hilling and seeding. Johnny's Broadfork is an amazing tool that lets you aerate the soil without using a tiller or bringing up a lot of weed seeds. You just push the tines into the soil, stand on the cross bar, and rock backwards. Pull it out, move back 6-8", and repeat. It's fun, easy, and kind to your soil. It's especially useful in the close confines of a hoophouse. It comes in three widths, and there's even one for harvesting root crops. Watch video about Johnny's Broadforks. Actinovate® contains beneficial bacterium in a water-soluble powder that can be used as a soil drench against pythium, rhizoctonia, fusarium, and many other soil-borne diseases. It also can be used as a foliar spray against airborne pathogens such as powdery and downy mildews, botrytis, and alternaria. Champ® is a copper fungicide for the control of early and late blight, leaf spot, bacterial blight, and many other diseases. It can be used as a preventative or at the first sign of disease. Oxidate® is hydrogen dioxide that can be used for the prevention or control of plant pathogens, as a pre-plant dip, soil drench, foliar spray, and surface disinfectant. It can be alternated with Champ or other copper fungicides to prevent the development of tolerance. For details on which products are effective against specific diseases, please see the chart in the Grower's Library on our website. The Zuchini looks fabulous! Im growing a few kinds as well! I may put that on my list for next year, i bet its worth the extra room it needs. Oh, i wanted to mention that i have had a pack of seeds for Sunburst Pattypan squash that i have been planting from (off and on) that i bought for 2002 season. I finally used the last seeds and they have all sprouted. Thanks for being that great company Johnny's.